I’ve always thought of hydrangeas as one of a gardener’s best friends – they’re reliable shrubs originating from Asia that are easy to grow, flower for simply ages into late autumn in many cases and just keep on going in the corner of the garden! Anyone who has a hydrangea will know they’re the ultimate low-maintenance addition to a sunny or lightly shady area; they grow large, fill up a nice sizeable spot and really only need basic love and care. Simply plant one with a nice helping of compost in its hole, then give it a feed of general fertiliser only once in spring to last the season and your job is done, apart from a flower head trim and a prune of any excess or weak stems in spring. They’re such popular, well-known stalwarts of the garden and yet it’s funny how they always seem to turn heads every time we see one with a vast covering of pretty blooms. And always traditionally in a host of pink, white and blue shades. These days, the colour combinations available are superbly vibrant and zingy. Take the variety ‘Glam Rock’ for example, voted best new plant in 2014 with eye-catching neon-pink, purple and lime flowers. If your tastes are rather more elegant, try a wonderful paniculata variety such as ‘Limelight’, which has pointed pyramid flower clusters of lime-green and white, which fade to pink. ‘Vanilla Fraise’ is a tasty treat too – almost literally, as its pink and white flower mounds look temptingly like raspberry ripple ice-cream as the weeks roll on! Hydrangeas have a charming quality that helps them stand out – their quirky colour-changing flowers. In late summer, as they age, sometimes the hue of what was your straightforward pink plant will have turned an interesting green or red, or your white one has turned pink! But the most fascinating example is to do with soil ph. 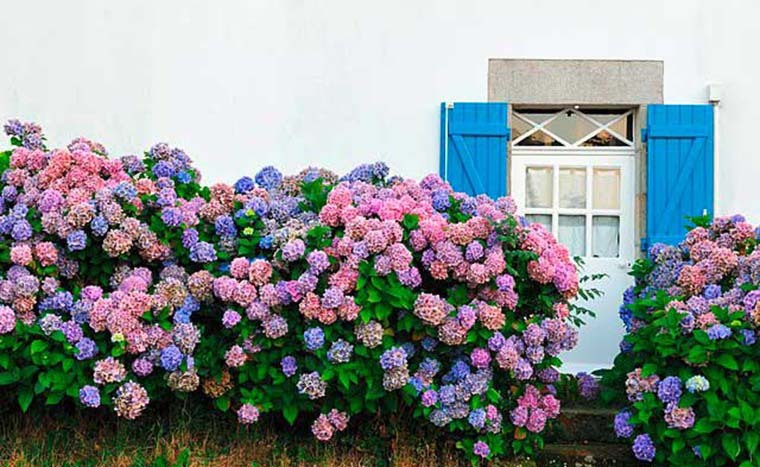 Site your pink hydrangea in acidic soil and it will go bright blue. Leave it in more alkaline soil and it’ll stay pink. The very same plant can be side by side, one in a pot of ericaceous (lime-free) compost and the other in ordinary soil, and be completely different colours! A good tip for once the late-season show is over is to leave the crispy flower heads on your hydrangea. You could cut a couple of stems for an indoor display, but leaving them on until spring will help protect against Jack Frost in the winter months.